When you give a speech, you’re advised to think about the one or two things you really want people to takeaway from your presentation because they’re going to forget 90% of it. My guess is that parenting is somewhat similar so I spend quite a bit of time thinking about the most important traits that I’d like to instill in my son. One that I’ve been pondering lately is the ability to disagree with someone without getting angry at them. I’m always pleasantly amazed when I witness or participate in a discussion where people take opposite sides and walk away smiling. Every discussion doesn’t require a winner. Isn’t it enough to just exchange ideas? How many people have changed your mind by yelling at you? Why do we wall think it will work on other people? That’s one reason why I enjoy the “No Dumb Questions” podcast. I originally heard about it because one of the hosts is Destin from Smarter Every Day. I really enjoy Destin’s work but his co-host, Matt, is equally enjoyable. They’re not totally different humans, but they definitely disagree on a variety of topics and it’s extremely enjoyable to hear them hash out the different sides of a topic while remaining amicable throughout. I learn so much more than when two people are screaming at each other. Matt recently wrote a good post for the Christian Post entitled Why Are We Suddenly So Bad at Disagreeing? and it’s a good read. You can guess some of the points but he makes a couple others that I had never considered. 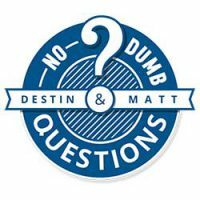 I won’t spoil his fun and summarize his article, but give it a read if you’ve thought about that topic before too and also consider giving a couple episodes of No Dumb Questions a listen. If you have to pick one, give episode 29 a listen. They gave into requests to discuss gun control. I don’t know that I fully agree with either one of them but it was really enjoyable to listen to them have a rational, friendly discussion on a topic that seems instantly explosive.